Andretti Autosport completed an all-American lineup for the 103rd Indianapolis 500 in an all-American way on Wednesday, naming Conor Daly to drive the team’s fifth entry at “The Greatest Spectacle in Racing” with sponsorship from the United States Air Force. Daly will attempt to qualify for his sixth Indy 500 this May in the No. 25 U.S. Air Force Honda and will have four fellow American drivers as teammates: Marco Andretti, Ryan Hunter-Reay, Alexander Rossi and Zach Veach. Daly, from Noblesville, Indiana, made his NTT IndyCar Series debut at the Indy 500 in 2013. He has competed in the race every year since, except in 2014, and logged his best finish a year ago by driving to 21st place for Dale Coyne Racing with USAF sponsorship. The Air Force will also become an associate partner of Andretti Autosport, with branding across the four full-season entries for Rossi, Hunter-Reay, Andretti and Veach, solidifying the teamwork effect. It’s a theme central to how the U.S. Air Force accomplishes its mission. 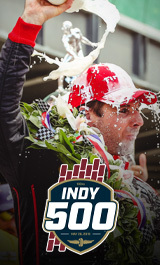 Hunter-Reay and Rossi are each past Indianapolis 500 champions for Andretti Autosport, which has won the great race five times, including three of the past five. Team CEO Michael Andretti was proud to add Daly and the U.S. Air Force to the all-American lineup. Joining Andretti Autosport for the Indianapolis 500 reunites Daly with some of his closer friends on the INDYCAR circuit, including Rossi. The duo teamed in late 2017 to compete in “The Amazing Race,” the CBS reality adventure show. Daly and Rossi made it to the final round before finishing in fourth place.